Made in America with its super clean, simple look, the Houston’s solid design will provide years of usage. 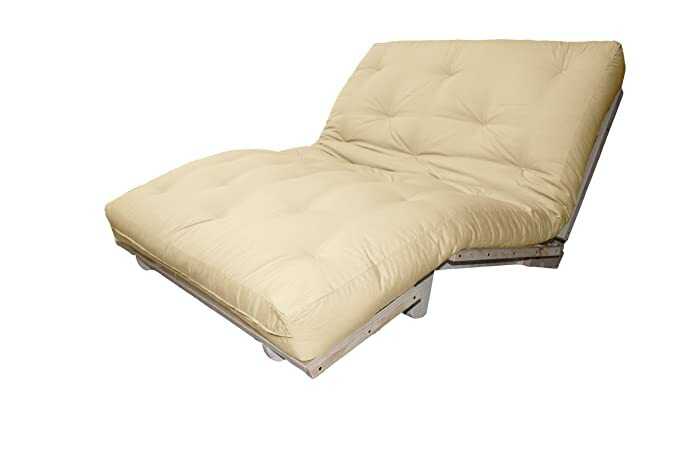 The Houston’s unique patented design allows an amazing 13 different positions, including 4 sitting positions, 8 chaise recline positions with the foot rest level, or slanted, to the floor, plus the flat position. The back angle can be set to any of 4 positions and the foot-rest has swing down legs so that it can be used in the foot-up or foot-down position. In addition the foot-rest section folds under out of the way for the sitting position. The Houston also easily converts to a 10 high platform bed by folding the back down flat and raising the foot-rest. The frame is made of only solid woods, because only these woods can completely resist warping or splitting. No plywood or veneer is used; only solid hardwoods pass the test for long-lasting beauty & durability. The Houston is made to last, providing years of uncompromising use. The Houston has been carefully designed & manufactured by means of an eco-friendly process. Our futon frames are the strongest in the world with 6 stress support bars under each seat/back with 2 bolt, 1 dowel construction. Love at First Sit. What creates the comfort of the sit is the combination of mattress selection and frame geometry. The Houston meets the leisure furniture U.S. sitting standards for optimal sitting comfort. The Houstons sitting angles can be infinitely adjusted to specifically meet your personal preference, combined with the ability to adjust the futon mattress; you can end up with a sitting comfort that is perfect for you. Twin-size sitting dimensions: 36-40 deep x 39 wide x 18 seat height x 36 back height in inches. Sleeping dimensions: 75 long x 39 wide in inches. Assembly Required. Live & email assembly assistance and assembly videos are available. The product ships in 2 boxes. Mattress is vacuum packed; please allow a few days for all fill materials to return to full thickness, and the fabric to smooth out. Made in America with its super clean, simple look, the Houston’s solid design will provide years of usage. 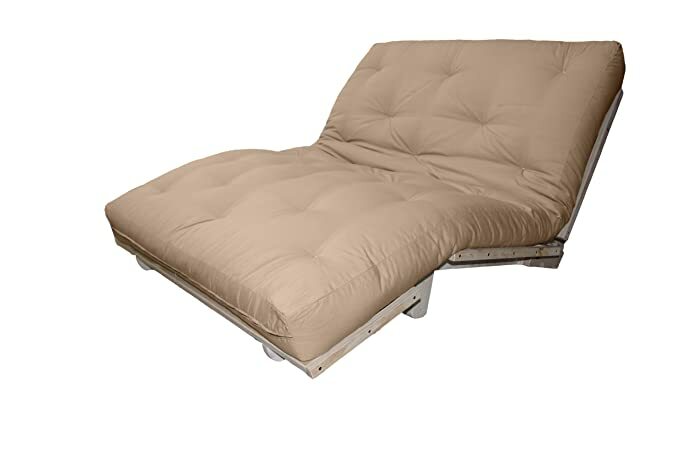 The Houston’s unique patented design allows an amazing 13 different positions, including 4 sitting positions, 8 chaise recline positions with the foot rest level, or slanted, to the floor, plus the flat position. The back angle can be set to any of 4 positions and the foot-rest has swing down legs so that it can be used in the foot-up or foot-down position. In addition the foot-rest section folds under out of the way for the sitting position. The Houston also easily converts to a 10 high platform bed by folding the back down flat and raising the foot-rest. The frame is made of only solid woods, because only these woods can completely resist warping or splitting. No plywood or veneer is used; only solid hardwoods pass the test for long-lasting beauty & durability. The Houston is made to last, providing years of uncompromising use. The Houston has been carefully designed & manufactured by means of an eco-friendly process. Our futon frames are the strongest in the world with 6 stress support bars under each seat/back with 2 bolt, 1 dowel construction. Love at First Sit. What creates the comfort of the sit is the combination of mattress selection and frame geometry. The Houston meets the leisure furniture U.S. sitting standards for optimal sitting comfort. 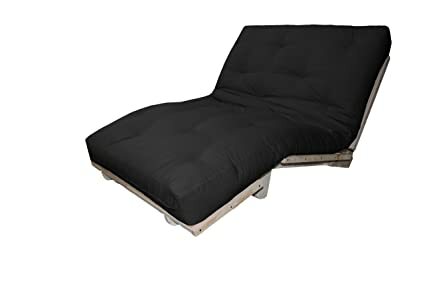 The Houstons sitting angles can be infinitely adjusted to specifically meet your personal preference, combined with the ability to adjust the futon mattress; you can end up with a sitting comfort that is perfect for you. Queen-size sitting dimensions: 36-40 deep x 60 wide x 18 seat height x 36 back height in inches. Sleeping dimensions: 80 long x 60 wide in inches. Assembly Required. Live & email assembly assistance and assembly videos are available. The product ships in 2 boxes. Mattress is vacuum packed; please allow a few days for all fill materials to return to full thickness, and the fabric to smooth out. Made in America with its super clean, simple look, the Houston’s solid design will provide years of usage. 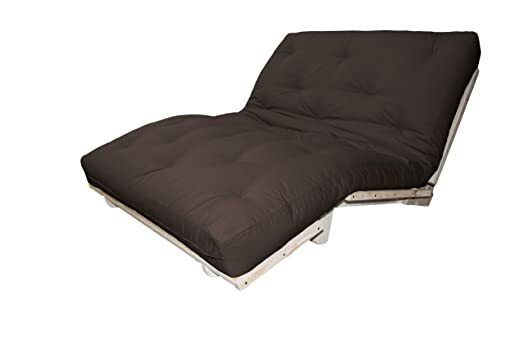 The Houston’s unique patented design allows an amazing 13 different positions, including 4 sitting positions, 8 chaise recline positions with the foot rest level, or slanted, to the floor, plus the flat position. The back angle can be set to any of 4 positions and the foot-rest has swing down legs so that it can be used in the foot-up or foot-down position. In addition the foot-rest section folds under out of the way for the sitting position. The Houston also easily converts to a 10 high platform bed by folding the back down flat and raising the foot-rest. The frame is made of only solid woods, because only these woods can completely resist warping or splitting. No plywood or veneer is used; only solid hardwoods pass the test for long-lasting beauty & durability. The Houston is made to last, providing years of uncompromising use. The Houston has been carefully designed & manufactured by means of an eco-friendly process. Our futon frames are the strongest in the world with 6 stress support bars under each seat/back with 2 bolt, 1 dowel construction. Love at First Sit. What creates the comfort of the sit is the combination of mattress selection and frame geometry. The Houston meets the leisure furniture U.S. sitting standards for optimal sitting comfort. The Houstons sitting angles can be infinitely adjusted to specifically meet your personal preference, combined with the ability to adjust the futon mattress; you can end up with a sitting comfort that is perfect for you. Full-size sitting dimensions: 36-40 deep x 54 wide x 18 seat height x 36 back height in inches. Sleeping dimensions: 75 long x 54 wide in inches. Assembly Required. Live & email assembly assistance and assembly videos are available. The product ships in 2 boxes. Mattress is vacuum packed; please allow a few days for all fill materials to return to full thickness, and the fabric to smooth out.